Welcome to another Taylored Expressions Blast From The Past blog hop! 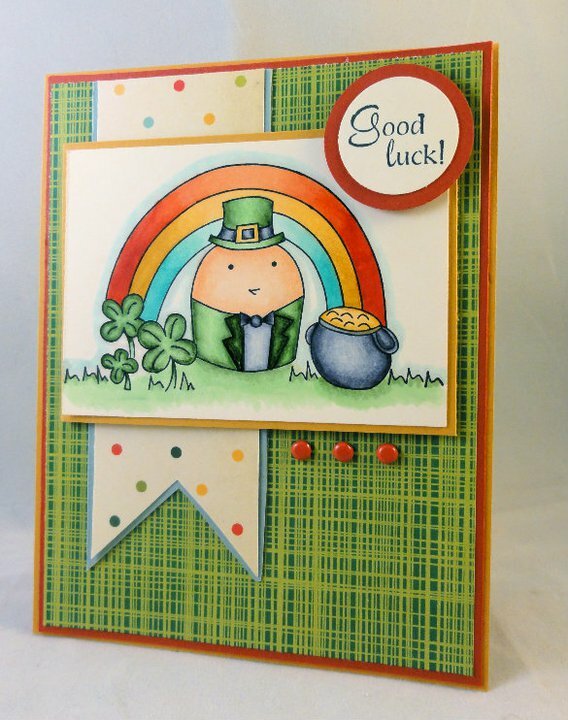 This month's theme was "Going Green" so of course I created a St. Patrick's Day card using this adorable image from "A Year of Sweets 1" and I used the sentiment from the set called "A Year of Sentiments". The paper I used is from the Cosmo Cricket Garden Variety line. The sketch was designed by Sankari and you can find it on the Taylored Expressions blog! Now hop on over to the other participants! I know I'm excited to see what they've come up with! Well thanks so much for stopping by today! I hope you have time to play in today's challenge! There are some awesome opportunities in store for you! ﻿Each week the team will vote on a TOP Lollipop CARD and that designer will receive a digi from the BLD Shop and will have an opportunity to be our guest designer for the following challenge. How awesome is that??? 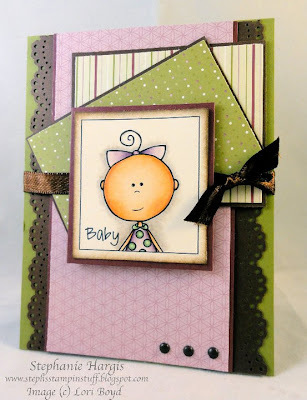 Make sure you stop by the By LORi Designs challenge blog to see what the other lovely ladies have created! Have a fantastic Thursday! I won this awesome stamp set at the last Flourishes release and just had to create a different Valentine's Day card for my husband! This set was absolutely perfect for us since we are such a musical family! Nick plays almost every different type of guitar imaginable so of course I made him a card with a Valentine! I thought I would also enter this card into the Flourishes "Bring Back Beautiful" challenge for this month! Well that's it for me! We are on our way to Iowa so we can show our daughter off to all of our friends and family! I'll be posting sporadically throughout the week so hang in there with me! :) Thanks so much for stopping by and I hope you have a fantastic Valentine's Day! Last week's Kraftin' Kimmie challenge was to create a card using lots of red. Well my card didn't turn out exactly as I had pictured in my head but I still think it looks alright. I pulled out Charlotte again for this challenge and paired her with some more Cosmo Cricket Garden Variety dp. I just think this designer paper is so much fun! I can't get enough of it lately! Anyway, I colored her in with my Copics and embellished with some ribbon and buttons! Slowly but surely I am becoming more acquainted with my Copic markers. It's taken me awhile to find my favorite method but I think I finally have it! :) As for the sketch of this card, I used today's Friday Sketchers layout! By Lori Designs Challenge #4 Plus An Announcement! Edited to add: I played around a bit and tried to take a new picture of my card using better lighting. I was able to get a slightly better picture. Hopefully they only continue to improve! I have some VERY exciting news! I was asked to be on the By Lori Designs challenge design team! :) I absolutely LOVE By Lori Designs images so of course I was thrilled to be chosen! 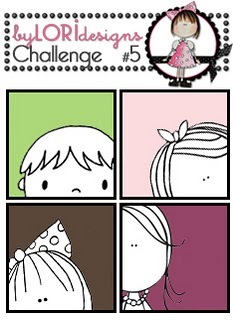 Lori creates the most adorable images and they are so much fun to color! I am joined by MANY talented women so be sure to stop by the BLD blog to check them out. 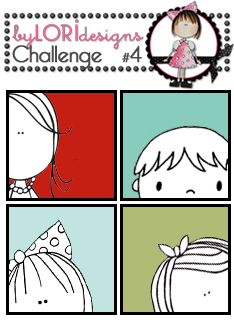 Without further ado, here is this week's color challenge! This week's color challenge was a little bit of a struggle for me. I can't seem to make a card without using designer paper and I found that the Cosmo Cricket Garden Variety paper was almost a perfect match. It just had some yellow thrown into the mix so I went with it! My image is from the Sugar Sticks line and it is called "Love You Friend". I love how versatile this image is! It can be used on either a masculine or feminine card and for almost any occasion! I colored the image with my Copics and used this month's Sketch For You To Try as my layout! I sponged the edges with some Antique Linen distress ink and embellished the card with some ribbon and buttons! Overall I absolutely love how my card turned out! The only thing I am disappointed in is the fact that my picture didn't turn out that great. I am still trying to figure out why my photos don't look as bright as they used to. Hopefully I can get it figured out soon! Thanks so much for stopping by today! I hope you have time to play with this week's challenge! So back to my husband's birthday card, he absolutely loves moose (I think I've mentioned that a time or two before) and so of course I had to use this adorable Ed the Moose stamp from Kim Hughes and pair it with the fun little mountain image from the Bear Hugs set. The Mr. Campy dp from Cosmo Cricket was the perfect pair to these images as well! I used this week's Mojo Monday sketch challenge as the layout, colored the images with my Copics and sponged the edges with some Tim Holtz distress inks. Let's just say Nick liked the card. After he opened it he said "This is your best card yet!" WOOHOO! :) That definitely made my day! Thanks for being patient with me these past few weeks! I promise things will get better, it's just taking me time to adjust! Stay tuned for tomorrow's card as well as a fun announcement!